Kim Murray has been a member of Lambton Chambers for over 20 years. His practice over that period has included accident compensation, appellate advocacy, biosecurity, censorship, health and medico-legal, judicial review, public inquiries and maritime and aviation law. Kim’s practice has an emphasis on public law (administrative law, constitutional law and international law) including liability and legal risk management advice for Government clients. He routinely acts for State-owned enterprises, Crown entities and statutory office holders. He has extensive public law litigation experience. Kim has particular expertise in air and space law. He has acted as counsel in many inquiries and aviation cases at both trial court and appellate level. As well as acting for New Zealand Government clients, he has acted both for and against aviation underwriters’ interests. He also undertakes overseas consultancy assignments. In particular, he has been team leader on projects funded by the International Civil Aviation Organisation (ICAO), the Asian Development Bank (ADB) and the World Bank. Kim has taken a lead role in organising three international aviation law conferences in New Zealand and is a regular speaker at aviation law conferences in New Zealand and overseas. His presentations and publications have covered a wide range of aviation and public law topics. As well as practising as a barrister and aviation law consultant Kim is a not-for-profit company director. 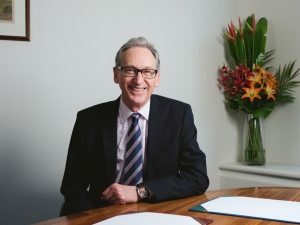 For many years he was on the board of the Aviation Law Association of Australia and New Zealand Limited (ALAANZ) and served as Chairman from 2006-2008. He is currently Chairman of Slot Coordination New Zealand Limited, a company formed in 2013 to manage airline slots at New Zealand’s four international airports. Kim’s previous legal roles have been legal adviser in the New Zealand Ministry of Transport, Crown Counsel in the Attorney-General’s Department (Crown Law Office) and law firm partner in a New Zealand national law firm. Kim’s postgraduate studies have been in the field of public international law. He has previously taught air law in the LLB(Hons) and LLM programme at the Faculty of Law, Victoria University of Wellington. Government Responsibility for Aviation Safety Oversight in Small Pacific Island States – the PASO Experiment – the David Boughen Memorial Address to the 2016 Annual Conference of the Aviation Law Association of Australia and New Zealand, Canberra 2016. Harmonising Pacific Aviation Law – Pacific Skies, Issue No 6, October 2014. The Confidentiality of Air Traffic Control Recordings? The Ron Chippindale address to the Australia and New Zealand Society of Air Safety Investigators’ Conference Wellington 10-12 June 2011 (published in ALAANZ Aviation Briefs Vol 57: Winter 2011). Rule-Making and the Implementation of International Law Standards, paper presented to the Lexis Nexis Conference on Legal Issues for Crown Entities, Wellington 23rd September 2009. Recent New Zealand Airport Litigation ALAANZ Briefs Vol 45 October 2008. Collaborative Safety Oversight in the Pacific Region – Presentation to the 27th ALAANZ Conference, Sydney, 7-9 May 2008. Legal and Technical Review Report for the Pacific Aviation Safety Office (PASO) August 2007. Report by the consultants (K.I. Murray, Team Leader, R.I.C. Bartsch, M. M. Foon) August 2007. State Sovereignty and Cross-border ANS Arrangements Presentation to the CANSO CEO’s Conference, Maastricht, The Netherlands, 12 February 2007. Christchurch Coroner’s Report on Piper Chieftain Crash on 6 June 2003, ALAANZ Aviation Briefs Volume 32: May/June 2006. Air Accident Investigation: The Role and Approach of Coroners in New Zealand Proceedings of the 24th Annual ALAANZ Conference, Melbourne 16-18 March 2005. The Future of Aircraft Accident Investigation Address to the Aviation Industry Association Conference, Christchurch 2002. Protecting Private Interests in Public Law Consultation, New Zealand Law Society Public Law Seminar Wellington June 1999. Getting the Result : Taking the Law to the Judge, New Zealand Law Society Public Law Intensive Seminar, 21-22 September 1998. The Importance of Treaties in Civil Aviation, International Law Association (NZ Branch), Treaties and Domestic Law Conference Wellington, 7-8 August 1998. The Cockpit Voice Recorder Debate : Public Interest or Pilot Interest? Proceedings of the 17th Annual ALAANZ Conference Melbourne, 6-9 September 1998. Cockpit Voice Recorders in the New Zealand Courts  The Aviation Quarterly 216. The Law Relating to Satellite Navigation and Air Traffic Management Systems – A View from the South Pacific, Royal Aeronautical Society CNS/ATM Forum Sydney, 16 April 1998, revised and updated version published in (2000) 31 VUWLR 428 and also Journal of the Royal Institute of Navigation Vol 53 No. 2 (May 2000). The Recent Treatment of International Law by New Zealand Courts, ANZSIL Proceedings of the Third Annual Meeting Canberra 1995. Civil Aviation Liabilities in New Zealand, (in Leading Developments in International Aviation Insurance) Lloyds of London Press Ltd 1991 – originally a conference paper presented at the Asia Pacific Insurance Conference, Bangkok 1991. Kim has recently acted for the owner of a Cessna Citation corporate jet in a contractual dispute with the company engaged to manage the aircraft’s operations. The High Court has recently held that the company was in breach of contract but that the owner did not give a valid seven day notice to remedy the breach. The case settled shortly after the High Court judgment. In another aviation case in the High Court, Kim has been acting as counsel for the family of a passenger who died on MH17 which was destroyed by a missile in Ukranian airspace on 17 July 2014. The claim was brought in New Zealand in reliance on the 1999 Montreal Convention for the Unification of Certain Rules for International Carriage by Air and has recently resulted in a confidential settlement. Recently Kim has also provided advice on various aspects of air and space law relating to remotely piloted aircraft systems, high altitude balloon flights, novel types of personal aircraft operations, space launch activities and the implications of the Outer Space and High-Altitude Activities Act 2017. In the maritime field Kim is acting for the maritime safety regulator in an appeal to the District Court against the revocation of maritime documents on the grounds that the appellant was considered not to be a fit and proper person to act as the Master of passenger-carrying vessels. The appellant succeeded in his appeal in the District Court. The regulator has now appealed to the High Court on a question of law and the Court’s judgment is awaited. In the field of constitutional and administrative law Kim has recently acted in a judicial review proceeding against the Chief Ombudsman. The case involved the exercise of a statutory discretion by the Chief Ombudsman who declined approval for a financial complaints resolution scheme to use the name “Ombudsman” in its title and description of its services. The Court of Appeal has now allowed an appeal from the High Court on the grounds that the Chief Ombudsman applied an unlawful policy. The Chief Ombudsman has been ordered to exercise his discretion again in accordance with the Court’s judgment.